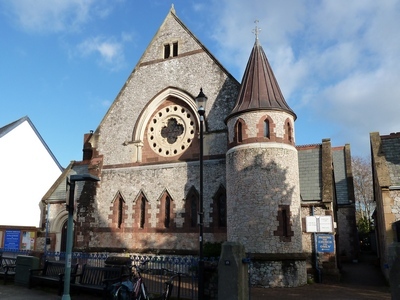 Situated in the centre of Topsham, St Nicholas Methodist Church recently celebrated 150 years since its opening, although local Methodist worship goes back a further 50 years in the town. 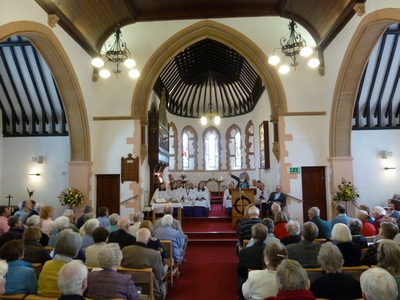 The Church was full for its 150th anniversary services in May 2017 when it welcomed friends from the other Topsham churches and the Exeter & Plymouth Methodist Circuit. The occasion brought great joy and encouragement to the local congregation which will be continuing to focus on its current mission of Rediscovering the Face of Jesus. 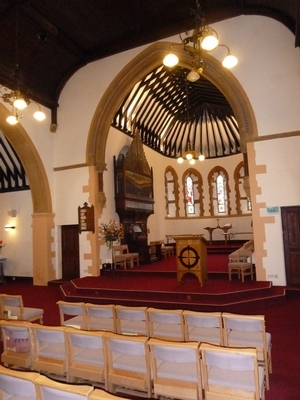 Over the coming year, St Nicholas will not just be looking inwards through regular Bible study mornings but also outwards via the Church prayer board, the well-supported Saturday coffee mornings, a regular memory cafe, a Christmas tree festival and frequent lettings of the premises. Local ecumenical links are strong and St Nicholas plays a full part in joint services and, on Good Friday and around Christmas, walks of witness through the town. The Church is situated in Fore Street, which is a one-way street entered from the Exeter end of the town. The Church is on the left, half way down the street, at the point where the street narrows. There is a very small space in front of the Church for car parking, to which access is somewhat awkward and tight. Visitors may therefore prefer to park in the street (at no charge on a Sunday) or to use one of the town’s car parks, at Matthews Hall (Fore Street), on the Quay or in Holman Way (for all of which there is a charge).